“Inflation wrapped us, from the perverse SICAD currency exchange we moved onto the marginal system SIMADI, which is nothing more than the commercialization of import products, in this case printing presses, with a disproportionate increase in the price of the dollar of 3,000% in the last six months, making it impossible for small and medium-sized media industries to survive, inflicting on us an economic and technical closure. What used to be just 14 million bolivars to get the paper out daily, has now turned into 46 million bolivars. As the headline leaves clear, this isn’t the first time NotiDiario is forced to shut down because of Newsprint-geddon, as the paper stopped publishing in February of last year. They came back months later, but the crisis has caught up with them again. Before its closing, NotiDiario faced a serious incident against one of its journalists, Pableysa Ostos, back in January, Ostos wrote an article detailing political infighting in Casacoima Municipality. During a press conference of the local council a couple of weeks later, the Council VP Isidoro Fajardo attacked her report for using unnamed sources. She complained that the mayor didn’t take her calls and that her sources were legally protected (by Article 28 of the Constitution). When she tried to leave the premises, she was briefly locked in by council members. 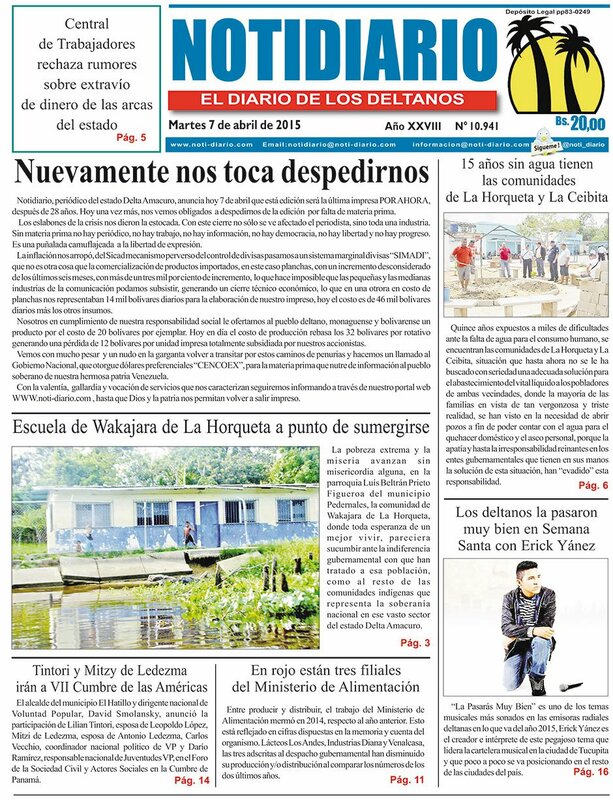 As Tucupita’s main newspaper closes, a bigger one remains on thin ice: Valencia’s El Carabobeño is still in serious danger of going under, as the earlier promise made by the central government of supplying them with newsprint has not been fulfilled. The paper could still go on for a month by using the newsprint for its Sunday magazine. And if no solution is found by that time, it’s game over.